Vegan diets are becoming more and more popular as people recognize the harmful effects eating meat has on our bodies, and on the planet. It’s not as easy as dropping meat from current meals; that would leave us bored, craving and feeling disconnected from our omnivores friends. One secret to being a healthy, happy and nourished vegan is to have fun exploring new foods. Embracing a plant-based diet will help protect you from cancer, heart disease and diabetes. A vegan diet will help you reach your health goals, boost your energy, maintain a healthy weight, improve your mood, sleep better and look great for the rest of your life! So how do you become a healthy, happy and nourished vegan? I’ve got 5 simple secrets to help you do just that! 1. Set an intention. Know why you want to adopt and maintain a healthy vegan diet. Is it for your health, in line with your ethics, for the environment or to lose weight? Whatever your reason, use it to set an intention for yourself to succeed and thrive with this lifestyle. Accomplishing your goals is so much easier when you have a strong reason for attaining them. 2. Eat a balanced diet. To be a healthy vegan you must eat a balanced diet. Sure, potato chips, popcorn and Swedish Fish (the candy) are vegan, but you won’t survive on a vegan junk food diet for very long. Instead fall in love with the delicious flavors, textures and colors of whole foods like vegetables, fruits, grains, legumes, nuts and seeds. A balanced diet is one that combines these different foods to create filling meals that are exploding with nutrition. Check out my blog, www.sweetpotatosoul.com for lots of exciting recipes. 3. Daily greens. A diet high in dark leafy greens will get you closer to longevity and greater energy now. For optimal health, eat greens at every meal; in your breakfast smoothie, in your salad at lunch or in your stir-fry for dinner. Kale, everyone’s favorite green, is super versatile and delicious, but don’t forget the other greens that should be on your plate. Collards, mustard greens, spinach, chard...the list goes on! Most greens are high in calcium, vitamin K, fiber, antioxidants, vitamins, minerals and protein. They even make the perfect snack food. Kale chips anyone? 4. Take your B12. If you’re already vegan, or familiar with the lifestyle, I am sure you’ve heard about this crucial vitamin. B12 is essential for the proper functioning of our nervous system, brain and the formation of blood. This vitamin is created by a bacteria, and found in animal products because animals eat food contaminated by the bacteria. It is easy to maintain your levels of B12 by taking a supplement or eating foods that are fortified with B12 on a regular basis. B12 deficiencies are serious, and can lead to brain and nervous system damage, as well as fatigue, anemia and depression. I recommend taking a B-complex vitamin. 5. Get support. It was so much easier for me to become a vegan, than it was for me to become a vegetarian. Why? Because I surrounded myself with people who supported my new lifestyle, and who had made the transition themselves. When you become a vegan, you’ll have many questions and a few concerns. In order to maintain the lifestyle, it’s incredibly helpful to have someone there to guide you through the journey. Bonus. Have fun with food! Enjoy new flavors, textures, colors and aromas. Explore exotic spices and herbs, and interesting sauces and dressings. Try new ways of cooking old favorites, and cook new things in old ways. Having fun with food is a crucial step in adopting a happy, healthy and nourished lifestyle. 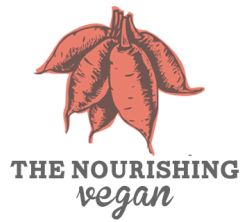 Whether you are seeking support, or guidance about what to eat, you’ll be happy you discovered The Nourishing Vegan. It is my intention to help you live healthier, happier and more nourished one delicious meal at a time! We will soon be accepting enrollment for the January 30-Day Vegan Challenge. To learn more about this popular program click here. And if you haven't already, sign up for the upcoming FREE preview call!